This article was written by Olly Frankland from RegenSW and is reproduced here for your information. The new FIT system – what does it mean for community energy? 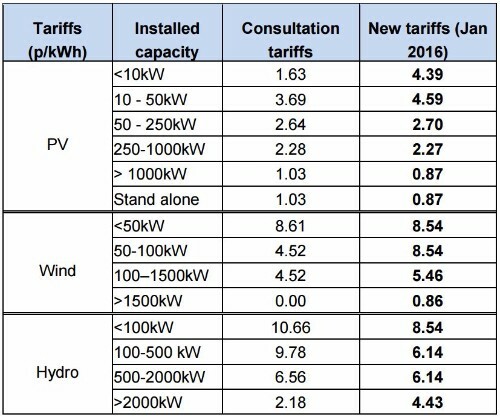 In comparison to the consultation levels, there were higher tariff levels for solar PV less than 50kW and onshore wind between 50kW and 1.5MW announced. Slightly lower rates for large solar PV – more than 1MW – and stand alone solar PV, will come as less of a surprise. Hydro has also seen some reduction in the anticipated tariff levels. The current Ofgem tariff tables will be maintained until the 15 January 2016 (see tariff tables – Solar PV only and Non solar PV). The export tariff has been maintained at 4.85p/kWh. DECC have also sustained the link with Retail Price Index (RPI) inflation link for export and generation tariffs (rather than the lower CPI proposed). The final budget has been confirmed as £100 million up to the end of 2018/19. In order to protect this budget a pause has been announced on new applications from the 15 January to 8 February. A new cap system will be introduced with quarterly limits for each technology. If you miss this cap you will be moved into a queue for the following quarter. The time and date (to the second) of an installation’s MCS certificate or application for ROO-FIT accreditation or pre-accreditation to be the basis for determining whether or not that installation qualifies under any particular cap. However, there is no guarantee of any support until they qualify under a cap. Government has also decided to implement only one degression threshold at the level of each quarterly cap. The new rate will be a flat 10% if the cap is hit. The first cap period will run from 8 February to 31 March 2016.
b) A budget reconciliation for FITs, which is expected to be biannual but could be more or less frequent depending on deployment. This would bring together any under spend and, subject to addressing any budgetary pressures, redistribute it as deployment cap ‘top-ups’. A table of the deployment caps and estimated number of installations per technology and banding can be found here. A table of scenarios for transitional installations over the period to 15 January can be found here. DECC has provided a little more certainty to the industry by reintroducing preaccreditation – the ability to apply for a guaranteed FIT level in advance of commissioning (See graphic for time frames). The original six month extension for community energy projects has also been reestablished. This is a critical advantage for community energy projects, given their longer time frames for development. However, the new cap and degression system means that if there is very high demand and you enter the queue, your tariff level could be considerably lower than envisaged. This will make it very difficult for community energy groups – which have a lower appetite for risk in comparison with commercial developers – to deliver projects under the new system. Secondly, DECC have announced the relaxation of energy efficiency criteria for qualifying communities and schools, which was present under the pre-registration system. This means that non-domestic community and school installations with a capacity up to 250kW can be eligible for higher solar PV tariffs at EPC band G rather than EPC band D. The preregistration tariff guarantee for some schemes has not been renewed. Finally, extensions to existing installations will not receive any FIT if they have not been commissioned before 15 January. This will impact community energy projects far more than other sectors, as sites are limited. Analysis of changes – the best we could have hoped for? This is in contrast to the big increase in risk for new projects from the new cap system and limited budget. Not to mention the changes to tax relief. Community energy groups will have to realign their business models under the new conditions and see if their projects are still viable. Then decide if the new risk levels in the FIT system are acceptable. The FIT announcements are probably the best we could have hoped for given where we were in the summer. Despite the deployment boom the scheme hasn’t been shut and has £100 million budget post 1 Jan 2016. This is due to the strong lobbying effort and the context of Paris. The global market is, however, moving towards a radically different decentralised energy system and nothing our government does will stop that. Over the next year, following our Pathways to Parity conference, Regen will be focused on supporting the new business models that will enable the renewable energy sector to adapt to changes – do get in contact if you would like to discuss working together.